Do you remember the potato chip commercial that stated: “Bet you can’t eat just one!”? I think this line resonated with so many people because it’s true. 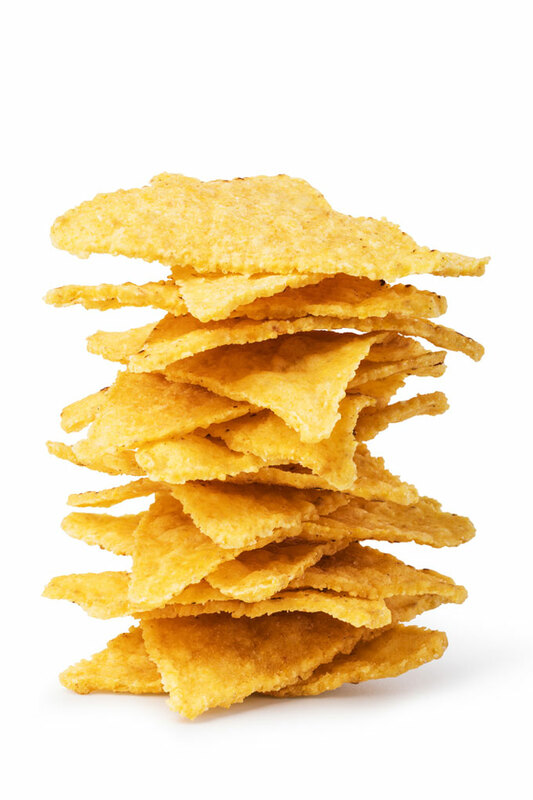 It’s quite difficult to eat just one chip – be it a potato chip, a corn chip, or a fruit chip. You open the bag of chips, thinking that you’ll have just a few, but before you know it, you’ve emptied the entire bag. I have this exact problem with corn chips. I’d like to think that I don’t have an obsessive nature, but I may be lying to myself when it comes to certain foods. 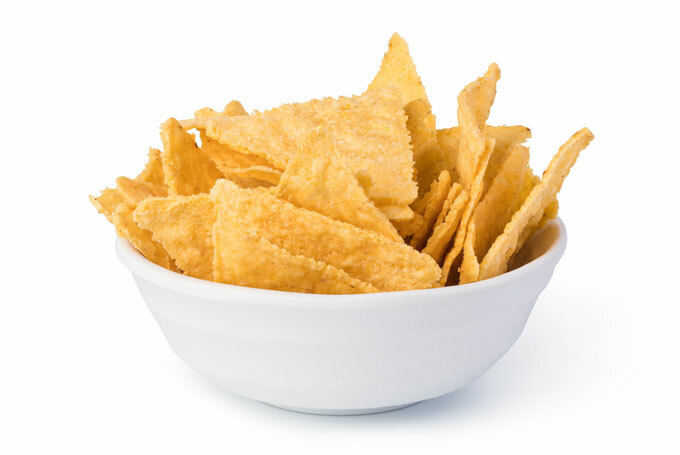 These Raw Corn Chips, for example. There’s just something about their faultless crunch, distinctive flavor, and just the perfect amount of salt. 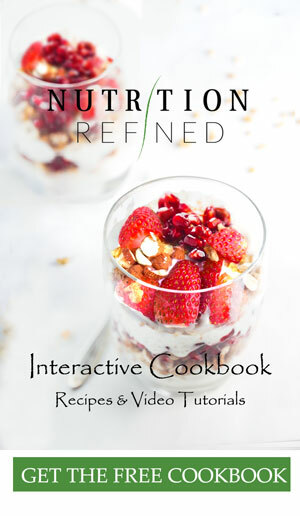 Since they only consist of four fully pronounceable ingredients – corn, flax seeds, salt, and water – I can’t even trick myself into thinking that they aren’t good for me. I mean, they aren’t even fried. They are dehydrated (or baked). And who doesn’t want to get healthier by eating chips? A dream come true. Apart from being healthy, there’s one more thing that sets these corn chips apart from the enormous bags of name-brand commercial chips. Their taste and texture is out of this world. First of all, corn is the number one ingredient that come through very clearly, not salt. I dehydrate (or bake) these chips until they are satisfyingly crispy with a very slight chew. I either eat these raw corn chips plain (because they are delicious on their own), or serve them with some authentic guacamole or pico de gallo. Since these chips are raw, you need to use sweet corn, not mature. Sweet corn doesn’t have a lot of starch so it’s actually really delicious. Of course, fresh corn is best, preferably straight from the field (I’m not asking for much, am I). But frozen sweet corn will do as well. Just be aware that most frozen corn is blanched and no longer raw. I am actually yet to find a bag of frozen corn that has not been blanched. So what I do is buy a lot of fresh corn cobs when they’re in season, remove the kernels from the cob, and freeze the kernels in a zip log bag until I’m ready to use them. I’ve tried making these corn chips without any binder, but they turned out very brittle. Ground flax seeds to the rescue. You can use either brown or golden flax seeds, but I prefer golden flax seeds for their milder flavor and lighter color. (I’m all about aesthetics when it comes to food). While I’m not a big fan of spicy food, my husband is. So whenever I make homemade chips, I make two batches: a plain one, seasoned with salt only for myself, and a spicy one for my husband. You can use any spice you like, but if you’re curious my husband’s favorite combo is chili powder and cayenne pepper. Although I often use parchment paper, I don’t recommend it for this recipe. The corn chip batter is quite runny. So if you try to spread the batter on a piece of parchment paper, the paper starts to wrinkle underneath. Silpat (a silicone mat), on the other hand holds its shape perfectly and doesn’t move one bit. So if you’re dehydrating these chips in the oven, use a silpat. If you’re using a dehydrator, the dehydrator sheets work just fine. When spreading the batter onto the silicone mat (or the dehydrator sheets), the layer should be paper-thin. I like to use an offset spatula to do this. Be sure the batter isn’t thicker at the center or it won’t crisp up properly. If the outside chips bake faster, you can always take them out of the dehydrator/oven and return the rest into the dehydrator/oven. 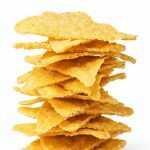 If you’re planning on storing these corn chips for a long period of time, dehydrate them really well otherwise they’ll go bad in storage. I tried dehydrating the corn chips at 115°F (46°C) as well as baking them at 300°F (150°C), but baking didn’t work. The corn chips just brown too quickly to be baked. The highest temperature I was successful with was 145°F (63°C). If you want break the chips into even pieces later on, don’t forget to score them. The best time for scoring the chips is after they have been in the dehydrator for about 4 hours. If you score them before then, the score lines might disappear. If you score them later, the chips might crack. However, even if you forget to score the chips, you can always break them apart once they are dehydrated. Also, as soon as the entire “chip” holds its shape (after about 6 hours), peel it off the silpat/teflex sheet, flip it remove the silpat/teflex sheet, and then put the “chip” directly onto the baking sheet/dehydrator tray. Raw corn chips made from fresh corn. Crunchy, savory, healthy, and so satisfying. Remove the kernels from the cob (if using fresh corn). If you're using frozen corn, thaw the kernels first. 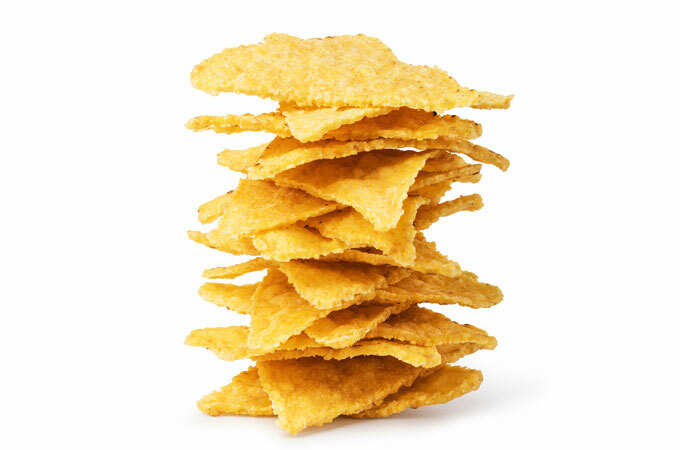 Spread the corn chip mixture onto a silpat or dehydrator sheets. Spread the mixture as thinly and as evenly as possible. An offset spatula works great for this. Make sure to not leave any holes. Store leftover chips in an airtight container at a room temperature for 4-5 days. Dehydrating depends on a lot of variables so check the chips every once in a while. If they're browning too quickly, lower the dehydrating temperature to about 105°F (40°C) . 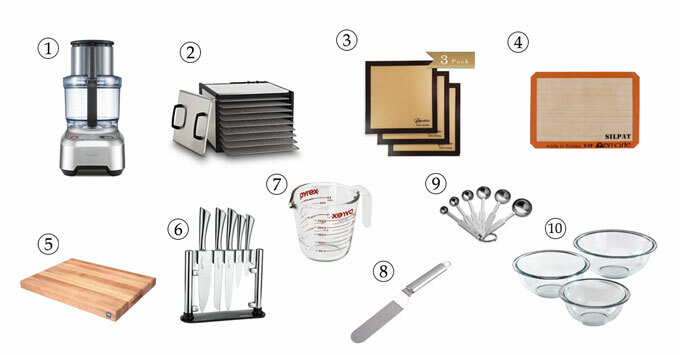 Hi petra, i really want to try and make these chips but i dont have a dehydrator, can i use an oven instead ? Hi Dalia – funny that you ask – I actually baked these chips in the oven the first time I made them. I baked them at 150 F. I was worried about them burning, so I would let them bake at 150 for 10 minutes, than I would turn the oven off for a while (so the temperature went down, and the oven was more like a dehydrator). Then I would turn the oven on for a little bit again, then turn it off … yea, very inefficient. The reason I did it this way was that I was at my mom’s house (and she doesn’t own a dehydrator, lol). So, to answer your question – I think the chips might turn out ok if you bake them at the lowest temperature. You’ll definitely need to keep an eye on them though. You don’t want the chips to brown (or worse, brown and not crisp up). Please, let me know how it goes if you give it a try. I would love to know if you can actually bake the chips (without turning the oven on and off, lol).